Now for something non-technical: my family and I visited the Jefferson County Fair again this year. This fair is small, and low-key, really oriented towards the local community rather than attempting to be some big event for tourists. I like it this way, and I encourage them to keep it going. But even so, it's got a certain tension between the main threads of activity:First, there's the 4-H theme: cat shows, animal husbandry, model rocketry, bee-keeping, etc. These are right in line with the the adult-themed activities: arts, textiles, baking, canning, rock-collecting and of course the equestrian events that cross-over generations. 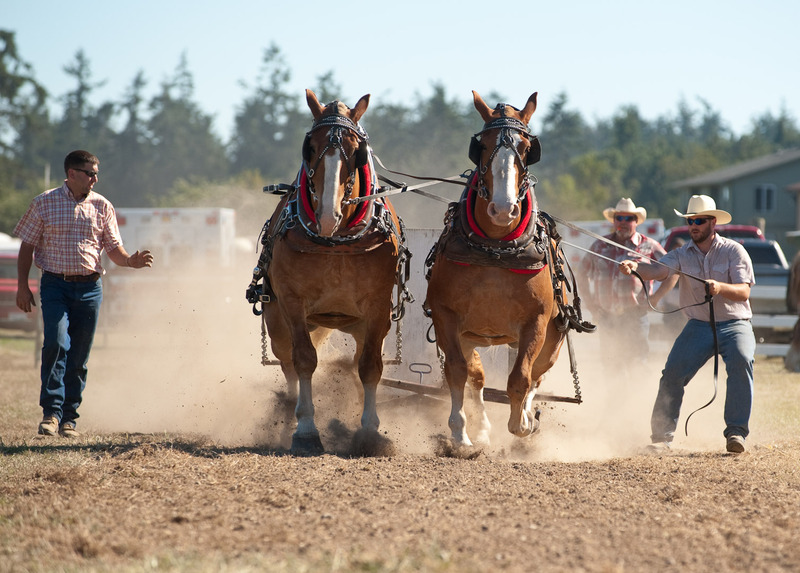 In keeping on the agrarian theme, it also has the horse-pulls: where draft horse teams compete to pull a loaded sled a fixed distance. This year's winning team pulled 7,500 lbs I think. Most of these teams are regulars: I recognize both the horses and their drivers going on several years now. But then there's the motorist events: where else could you find a demolition derby where the competitors are high school students? What better way to blow off steam? This is gender-neutral, last year's winner was female and her younger sister was driving this year (she didn't win, although another girl placed third.) And this is followed the next day by the adult version - the "mud drags" wherein people race their vehicles through pits filled with mud? The unlucky ones get towed out, sometimes with a broken axle... Totally different crowd. If you're interested in more pictures, the latest set is on my Flickr stream at 2010 Jefferson County Fair and you'll find prior year's sets in my Fairs and Festivals collection. There were several overall themes to the sessions I attended at OSCON this year, summarized below. The conference had a good feel to it, although I found myself routinely conflicted over which session to attend (and didn't always make the right choice.) Too many interesting topics is better than too few though. use the Simple Build Tool (sbt), it's the best way to build and manage Scala projects. It uses Ivy for dependency management, builds Maven-compatible hierarchy. Much easier than integrating with existing Eclipse and Maven projects. MongoDB was the subject of much discussion (and repeated Twitter jokes) - mainly because its implemented using virtual memory and people don't trust it, so that redundancy is required. Its an object store, with none of the other overhead of an RDBMS. No Joins and no complex transactions == horizontal scalability. SourceForge is using it now. Pig seems to hold a lot of promise: its a high-level data flow language that compiles down into map-reduce jobs. (aside: when the speaker showed his slide of all the Java code a few lines of Pig replaced - a baby in the audience started crying. Twitter erupted.) Estimate that it requires 5% of the code required by Java, similar reduction in developer time, and its within 25% of the execution time of a hand-coded map-reduce job now. Mahout - an overview of the open-source machine learning library, talked a bit about scaling it on Hadoop and some of the different algorithms it currently supports. Phonegap promises a cross-platform mobile development kit. Its for writing web applications that have access to the native device, getting there using a native wrapper that hosts a web browser that your web application runs in. The web application uses phonegap.js to access the native environment. Still UI issues between platforms, debugging is a pain. Speaker also favored qUnit, XUI instead of jQuery, and Lawnchair for client-side persistence. Android talks were sprinkled throughout, but the big event was an extra workshop that evening that required a separate signup. The 300+ developers that attended were rewarded with in-depth tutorials on Android UI design, asynchronous programming technique, and a Nexus One device to test it all out on. Tomcat security covered many of the vulnerabilities in TC6, which were fixed in TC7. XSS attacks are growing, and one has to keep adding filters for them. TC7 allows regular expression filters to help with this. Django was covered in a few sessions, I learned a little more about its deployment, which is pretty typical when you try to scale it up. Spring 3 Framework: I missed some of this talk, but had a chance to talk with the presenter afterwards, and review the slides. The most interesting parts were their growing support for Dojo, continued support for Flex, and their new Roo tool - allowing one to quickly create and scaffold a Spring-compatible server, much as does Rails. No more copy and prune! At least for development sites. Chef is an intriguing system for deploying applications and systems software to various systems in a large network. Looks a lot nicer than the one commercial offering I've had experience with. This might be a good way to spin up development servers quickly as well. Supports a variety of systems. Mirah language was introduced by Charles Nutter. Basically its a Ruby-like language with a twist: it compiles directly into Java bytecode or source, and does not require a runtime library. Basically its (mostly) Ruby with static typing. Go language, presented by Rob Pike, both in sessions and keynotes, garnered new interest from me. (Actually, I've pretty much ignored it, thinking the last thing the world needed was another C-based language!) Its simple like C, but has promising concurrency constructs. Testing was covered in a couple of sessions. One tool I need to look at is Cucumber. A speaker commented that they though Mock's were useless because they decoupled reality from your tests, then fail and are ignored. Also the need to keep tests fast, otherwise people push them off to the CI servers and they just ignore those messages. Also, think "outside in": if you are too close to the model or implementation you're not really testing functionality. There were separate tracks on Health Care computing, Cloud and Emerging Languages. Most of these sessions were being recorded, so I skipped them when there was an interesting conflict. I hope to catch up on some of them later.